Just a circle and a few lines. At the end of the day, that's all it takes to represent a human being on paper. But under the right hands, even a simple stick figure is capable of expressing limitless imagination and emotion. And it is this deceptively uncomplicated yet nearly universal art form that director Alê Abreu expands upon to create the gradually evolving beauty and mounting dangers of 'Boy & the World.' 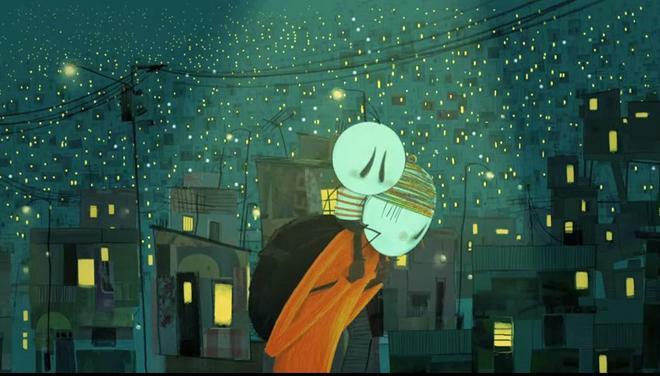 With its unique animation style, the film forms a dazzling commentary on man's shifting place within modern society, weaving a delicately powerful tale about curious youth and bittersweet adulthood. 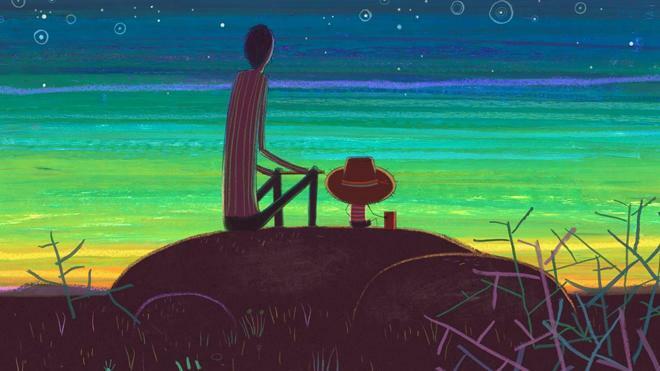 Told almost exclusively through images, music, and sound effects, the story follows a boy who ventures from his secluded village to the big city in order to find his father. As he embarks on his journey, the chaotic industrial world begins to devour his once peaceful surroundings. With technology and increasingly large crowds threatening to end his search, the boy will have to push through escalating perils to reunite with his family. Blending a mixture of traditional art styles and drawing tools -- including colored pencils, markers, crayons, and paint -- with advanced computer compositing, the filmmakers create a singular animation style brimming with palpable texture and personality. Through an abstract collage of simple stick figures, sumptuous colors, and increasingly detailed settings, the runtime deliberately transitions between otherwise modest imagery and comparatively elaborate sequences filled with intricate nuances. And this transition from the simple to the complex, perfectly mirrors the character's own deeper journey, capturing a childlike sense of exploration marked by growing curiosity, wonder, and fear as the boy moves from the innocence of nature into the disorienting commotion of the city. And as that journey continues deeper and deeper into technological chaos, the film bolsters its periodically surreal aesthetic with faint hints of sci-fi plotting to paint a larger picture of the pitfalls tied to industrial advancement. Towering metropolises with cluttered smog-filled slums continually expand under pristine bubble cities floating high in the sky while anonymous drone workers all toil away for the benefits of those in power and animal like machinery eats away at forests and jungles. It might not be the most subtle of social and environmental commentaries, but the film ultimately forms a rather striking examination of class oppression, dehumanization, and conservationism, using its deceivingly simple style to tackle not-so simple problems. By the time the film's cyclical finale hits the screen, we suddenly realize that the movie's bittersweet allegory has actually quietly folded into itself, forever blurring the line between past and present, and youth and old age. Both wondrously audacious in its form and deeply emotional in its storytelling, this is a visually arresting and delicately affecting work of art, touching upon powerful concepts related to family, nature, consumerism, wealth disparity, and the inherent bonds that tie humanity together -- all seen through the wide, innocent eyes of a simple stick figure. Universal presents 'Boy and the World' on a BD-50 Blu-ray disc housed in a keepcase with a cardboard slipcover. A DVD and instructions for an iTunes/UltraViolet Digital Copy are included as well. After some skippable trailers, the disc transitions to a standard menu. The movie is provided with a 1080p/AVC MPEG-4 transfer in the 1.78:1 aspect ratio. Marked by gorgeous animation, this is an immaculate image brimming with color and personality. Blending various traditional art techniques with computer compositing, the filmmakers create an ab-solutely stunning and deceptively modest visual style that oscillates between simple and complex depending on the scene. Detail is wonderfully realized, bringing out tiny, intricate textures in vari-ous shots, emphasizing the different tools used to create the images, giving each frame a tactile quality. Small background objects, like thousands of building lights in a sprawling cityscape, are per-fectly rendered, while large crowds of citizens and mounting traffic jams brimming with vehicles fill the stick figure world with increasingly detailed activity. Colors are absolutely sumptuous, bathing the screen in bright hues and vibrant primaries. Thankfully, I detected no signs of compression of digital artifacts, preserving the film's unique style without any problems. Artistically powerful and technically sound, this is a demo worthy transfer through and through, highlighting the film's colorful world with striking clarity and saturation. The film is presented with a DTS-HD MA 5.1 track, along with optional English SDH subtitles. Much like the video, the audio is exceptional, offering a nuanced aural experience brimming with life. The minimal dialogue present is an intentionally indecipherable reverse playback version of Portuguese -– and though one can't actually understand their meaning, the words come through cleanly and clearly. The nature settings all feature layered design work with fluttering birds, croaking frogs, and chirping insects, fully brining the jungle atmosphere to life. And as the boy transitions to the city, the soundtrack effectively transitions to urban effects with a heavy emphasis on industrial sounds like cars and traffic, mixing the audio with noises both subtle and aggressive while maintaining smooth imaging, precise directionality, and robust surround use. Key scenes, like one featuring a rainstorm that leads to a flood, and one featuring a cheerful parade, are especially noteworthy and carry deep LFE cues. Fully immersive and delicately enveloping, this is a truly stunning mix, balancing delicate design work and robust range to create a living, breathing world torn between bustling nature and chaotic industry. 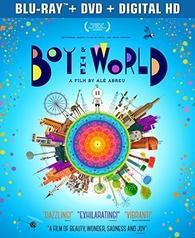 The Making of Boy & the World (HD, 26 min) – Presented in 1080p with Dolby Digital 2.0 audio, this is great behind-the-scenes doc about the film's production. The filmmakers discuss the development of the story and visual style, along with a detailed look at the unique animation process. Music Video by Emicida (HD, 4 min) – Presented in 1080p with Dolby Digital 2.0 audio, this is a music video for a track from the film with movie clips. Theatrical Trailer (HD, 2 min) – The movie's trailer is included. 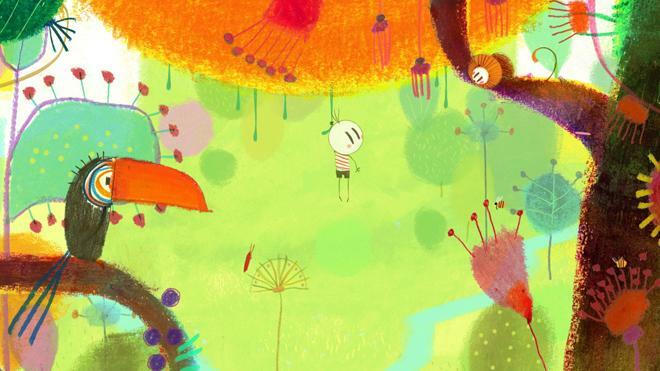 'Boy & the World' is a singular work of cinematic art. Using its unique animation style, the filmmakers create an abstract fable brimming with powerful emotion and thoughtful ideas. With 5-star video and audio, the disc also boasts a demo worthy technical presentation. Likewise, though supplements are a little light, the release includes a very worthwhile behind-the-scenes featurette, offering a great look at the animation process. Gorgeous and affecting, this is very highly recommended.